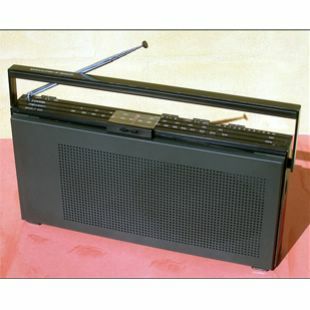 Beolit 505 was a pure FM radio with AFC facility to ensure clean, sharp reception. It had an in-built large, high quality speaker together with a built-in telescopic aerial. It had six programme indicators (affixed to sliding tuning scale) and connection for a tape recorder. It was designed by Jacob Jensen, the same as its FM and AM bigger brother, Beolit 707. The Beolit was one of the very few portable radios that were suitable for reproducing more than just news broadcasts. Sound quality was so good that music programmes could be reproduced with a quality that made them worth listening to. The Beolit was fitted with a mains transformer and a detachable lead. Operation was simple and problem-free. And since portable radios can end up in unenviable situations, the Beolit was constructed to withstand some rough treatment. A robust chassis protects the internal circuitry and a special surface treatment protects the radio from scratches. Dirty marks were easily removed with a damp cloth.